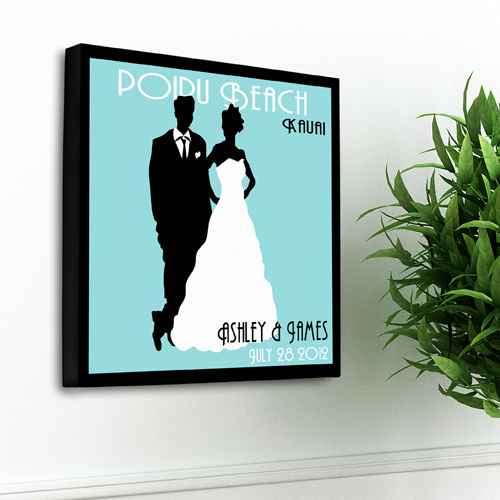 * A unique gift for the newly-married couple or the couple married for 50 years, our Personalized Couples Studio Canvas print is a vintage poster inspired print is a great addition to any wall. * The classic background color choices are the perfect backdrop for the bride and groom silhouette figures that are the centerpiece of this print. * Generously sized, display the print at your wedding reception and then hang it above the fireplace for an enduring keepsake of your special day or give as a gift celebrating a benchmark anniversary. * Measures 14" x 14". * Select from six of today's hottest décor accent colors. * Personalize each of the four lines with up to 25 characters per line.